As commissioning of massive intrastructural development project continues across the country, Nigerian Air Force Investment Limited (NAFIL) on Thursday again commissioned a multi-million naira tailoring workshop at NAF base Kaduna. The tailoring workshop which was equipped with 86 unit of state-of-the-art tailoring machines is capable of producing military and paramilitary uniforms for the country at lower rate because the issue of foreign exchange has been adequately taking care of. The workshop, which is also one of the NAF investment portfolio has different sections include fabric, cutting, overlucking, production line and quality control among others that can comfortably take care of sowing business in military. Chief of Air Staff (CAS), Air Chief Sadique Baba Abubakar while commissioning the gigantic business outfit on Thursday said, the investment will offer NAF staff and the federal government the opportunity to celebrate one of such achievements aimed at self-sufficiency by way of establishment of the NAFIL tailoring workshop. The Air Chief, who was optimistic that the establishment of the tailoring workshop will no doubt go a long way to ensure ample and timely provision of uniforms to NAF personnel at more cost effective rates, added that it would also provide an avenue for the hands-on training of airmen of the tailoring specialty, which the service would ordinarily have sought elsewhere at substantial costs. He said, “t is common knowledge that our nation is currently experiencing economic challenges. It therefore behoves on all of us to key into the Federal Government’s policy of prudent management of resources and self-reliance by coming up with ideas that would ease the burden on our limited finances and foreign exchange. 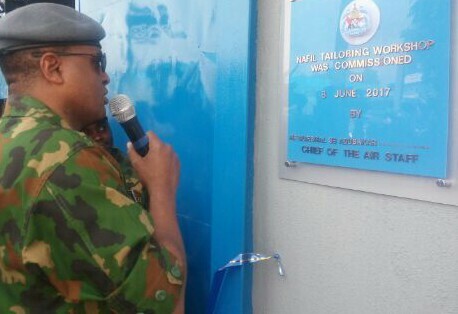 “The establishment of the NAFIL tailoring workshop will not only meets this desire, but would also go a long way in changing the perception of NAF personnel towards the Company, which is wholly owned by all NAF personnel. “The importance of a world class tailoring facility of this nature cannot be overemphasized. The NAF, with over 53 years of existence, is actually ripe enough to ensure the provision of its own uniforms and accoutrements without outsourcing sensitive and highly restricted materials to third parties”. He then called on the management of the workshop and the board of directors to ensure the sustainability of the commendable effort. Earlier, Managing Director, NAFIL, Air Vice Mashal A B Bagare also confirmed the CAS statement that the workshop will serve as a training establishment for airmen recruited into the NAF as tailors quickly added that, the headquarters of NAF had posted in the first batch of 15 airmen as part of the take-off staff of the workshop. He added that the workshop is hitting the ground running with sowing of 2,000 unit of number 4 trousers and production of uniforms for the US embassy security.